The rounded wooden legs and tops of these stools by Norm Architects of Denmark are joined by brass or steel tubes. Called Raft, the collection for design brand &tradition comprises stools in sand-blasted oak or stained ash, plus a table with the same material combinations. The Raft Table and Raft stools blend the roughness of natural materials, aging with beauty, with the industrial efficiency of metal structures. 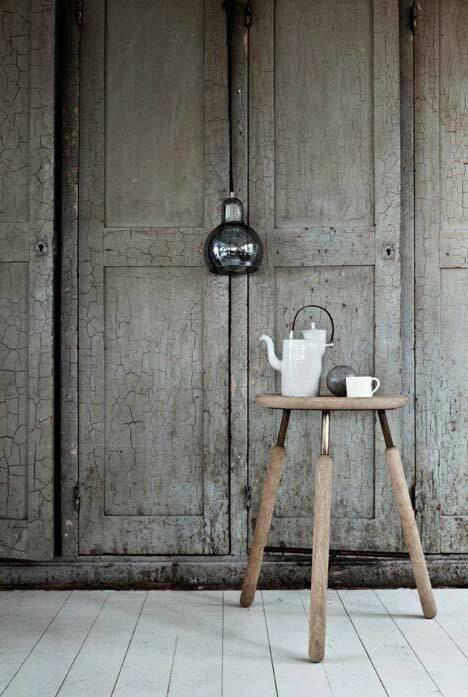 With a contemporary Scandinavian approach to the drift wood inspiration, the table and stools are unique pieces of furniture that combine simplistic purity and a discreetly sensuous look. The sandblasted surface of the table top adds a patinated feel, while the triple legs of round wood has the playful appearance of a living creature in motion. And the rounded edges beneath the tabletop or seat makes for a soft and pleasant feel when the hand touches the table. Lacquered steel or brass with legs of sandblasted solid oak or black stained ash. Top in sandblasted solid oak, white laminate or black ash laminate.